Are There Any Good Black Men Out There? Ladies, Ladies. Ladies, I know I said I would talk about why it is hard for a black woman to find a good black man, but please I was not expecting to be inundated with emails and text messages that I must hurry up and send out the blog. I have a LOT of female friends and in my day to day life I work with a lot of women and as a young black man (yes I do consider myself young, so no funny comments please), I am continuously asked by woman of all ages that where are all the good black men and why can’t “I” find one? Well you know me I am going to say it as it is and some of you will agree with me and some of you will send me an email or text telling me about myself, as Simon Cowell would say it’s only an opinion. It would take me forever for me to explain everything in a long essay style blog and I do not have the time to write a thesis on this subject so I will put it down in bullet point form. According to Oprah Winfrey 70% of African American women are single and it is believed that the percentage of black women in the UK that are single is of a similar percentage. · Their are more black women than black men? · Their are a high percentage of black men in jail? · Their is a high incidence of mental health problems among black men? · The pool of available black men is further reduced by the number of black gay men their are? · They say all the good men are married? A large percentage of black men are now dating Caucasian women, further reducing the pool of black men available to black women? Black women are considered too aggressive, have attitudes and no longer ready to be the woman in a relationship? Black women do not in significant numbers date outside of their race? A good percentage of black men don't have a job and as such are not considered as good catches for the well to do black woman? Not to mention Black women generally do not marry beneath their social status unlike men. Let me explain – nowadays as a whole black women are doing better socially and economically than black men. A black man that is a chief executive of a multinational could walk into Tesco’s and see a woman that he likes, woo her and marry her. However the chances of black woman that is a chief executive of multinational or any type of company marrying a dustbin man is significantly reduced. Ok looking at the above there is not really anything controversial in the points raised as they are just the facts as to why it is hard to find a good black man. Simply put, because the numbers do not add up, more woman than men equals a shortage of black men. But where it does get a bit controversial is the issue that raises its ugly head over and over again as to why are black men dating white women and further decreasing the number of available good black men. How many times as a woman do you watch TV or look in a magazine and say to yourself that successful black man, I bet he is going out with a white woman? Now don’t even think about denying it as I know that even if you have not done it yourself you have friends that have. Trust me I have heard it many a times and have myself been accused of dating or even it was expected that I was married to a white woman. For the record I have never dated or been out with a white woman in my life, they are lovely women but I just believe in “the blacker the berry the sweeter the juice” and I have to say my own AMEN to that. Anyway back to the subject at hand, I know that it riles black women up the wrong way when they see famous sports stars, politicians and movies stars dating or marrying white women. Now it would be unfair for me to single out anyone in particular but I would leave that for you to come up with your own examples. BUT why do black men both of status and the ordinary man now seem to prefer to date white women, is it because they will progress further in their careers with a white woman on their arm, it is alleged that this was the reason for Tiger Woods marrying his wife or is it because black women are WAY TOO stressful and black men can’t deal with the stress a black woman or could it be because the black women has become to independent and claims “I don’t need no man” and black men are now saying if thats how you feel than you can be bad all by yourself. (I blame Beyonce for this "Independent Women, Single Ladies (put a ring on it), Say My Name (now that is a good one to throw in there - I wonder what your response is to that one is), she has stirred up a revolution, but all you single ladies while you are singing the words to some of these tracks she is married and you are not, so be careful about how you throw these words in mens faces (just a friendly piece of advice). I was actually thinking that I would comment on all of the above but I love my life and I already get accosted about different aspects of my blog and I am not in a position to afford 24 hour round the clock protection, so I will leave you to debate it. I am not offering a solution/s but the one thing I would say is that if you find a good black man, do not automatically tar us all with the same brush, that we are all worthless, two timing no good players, no job black men, that have 50 babies from 70 different women (yes I did say 50 70) just trying to over emphasise how black men are perceived. The other thing ladies is LET IT GO, yes in your past some men will mess you about and mess you up emotionally, may even rip you off and leave you deserted at the alter but that does not mean that the new man in your life must pay for the sins of the man before the man, before the man. Every man is different, LOVE IS A GAMBLE, some you win and some you lose. Also sometimes it worth remembering that when you point a finger at a man three fingers are pointing back at you as not all black women are perfect. On that note I am swiftly moving on, hopefully with my life still intact. Top Model of Colour Holland took place on 27th March 2010 at the World Fashion Centre and it was a fantastic show, I was extremely impressed by what I saw and I must say well done to Monica Van Halder (TMC Holland Franchisee owner) and her brilliant team on the great show they people together (nearly said amazing, a word I hate as it is over used). 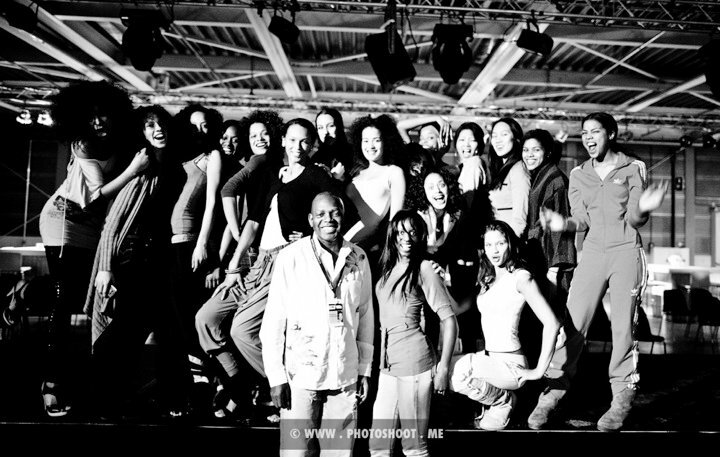 20 models competed to be TMC Holland and it was won by Adut Mawien, Kimberly (second) and Elise (third). Everywhere I go I am told over and over again whether it be within the modelling and fashion industry or within TV and film, that Black does not sell and I have always thought that it was just a UK thing. I just happend to be watching the OSCAR award winning actress Monique, on her chat show and she was doing a Soul Food reunion and she spoke about the fact that within the American film industry, producers do not like to make black films as black does not sell and she was saying that was a load of rubbish and I totally agree with her and I think tyler Perry is testimony to the fact that black does sell as via his “black films” he has become one of the richest men in the American film industry, the same goes for the owner of BET, Oprah Winfrey, Denzil Washington, Will Smith etc, these are all black actors that have made their Hollywood producers 100’s of millions of dollars. So people stop using that weak arse excuse to stop giving us work etc as for the companies that do make the move to add a bit of colour to their adverts it seems to be working for them for example look at the new Marks and Spencers campaign, Matalan, Halifax, Sandanter and the likes of GMTV that have been using black models during their fashion segments, they have not lost business because they use black models. This is a bit of an old story but I guess a lot of you may not know this. (this was copied from the Thaindian News). New York, Nov 11 (THAINDIAN NEWS) Sophia Stewart an African American who claimed to be the author of The Matrix will finally receive her just due from the copyright infringement of her original work, as the copyright case is finally settled in court. A six-year dispute has ended which involved Sophia Stewart, the Wachowski Brothers, Joel Silver and Warner Brothers. Sophia Stewart’s allegations, involving copyright infringement and racketeering, were well received and completely acknowledged by the Central District of California, where the Judge Margaret Morrow was presiding. Sophie Stewart had filed her copyright infringement case 10 years ago, in 1999, after viewing the acclaimed movie Matrix, which she felt had been based on her manuscript, ‘The Third Eye,’ copyrighted in 1981. In the mid-eighties Stewart had submitted her manuscript to an advertisement placed by the Wachowski Brothers, requesting new sci-fi works, which could be later made into a movie. According to court documentation, “an FBI investigation discovered that more than thirty minutes had been edited from the original film, in an attempt to avoid penalties for copyright infringement. The investigation also stated that ‘credible witnesses employed at Warner Brothers came forward, claiming that the executives and lawyers had full knowledge that the work in question did not belong to the Wachowski Brothers.’ These witnesses claimed to have seen Stewart’s original work and that it had been ‘often used during preparation of the motion pictures.’ The defendants tried, on several occasions, to have Stewart’s case dismissed, without success”. Sorry I know a lot of you do not like me talking about football but I have just have too (also you will be amazed at how many woman are seriously into football). It has been a tough long day with me being bombarded by Man U fans sending out jokes across the internet about the defeat that arsenal suffered at the hands of Barcelona. Yes to be honest we were well and truly beaten and our inexperienced, injury ravaged team was annihilated. I said it, so there is nothing else that need be said on that. BUT to all the Man U fans you should have at least controlled your teasing and jokes till you were certain that you had qualified, but you did not and the law of karma came into play and what happened you got knocked out by a German team even though you were winning 3 NIL, I repeat 3 NIL and you still got knocked out. I believe that in a well managed modern day society it is important that we pay tax to contribute to the maintenance of our society, so that roads can be repaired, our rubbish collected and hospitals and schools built etc but hello if I work a whole month, am I not entitled to have some money left over the day after pay day. I have to preach here (now imagine that I am on the pulpit of an African American Baptist church) and as I say each sentence I am dragging my words, emphasising them, with highs and lows, with a little bit of harmony, and a strong southern drawl American accent and you can be the congregation and throw in the occasional “amen”, “I hear you”, “preach pastor Sola” etc (no disrespect meant to real pastors), say whatever comes to mind. (ps I don’t know how to write it in words but the noise they make at the end of each sentence, I will be doing that) so if you know it say it – I will put thee dots at the end of the sentence so that you know where it comes in. O my lord I nearly forgot the most important payment after the tax man – your rent or mortgage payment, you sure don’t have any money left now!!!!!!!!!!! Now after you have paid all of these – how much do you have left on the second day after pay day – NOTHING – that is why we all live on credit cards and loans and have no savings. My suggestion on how to resolve this is move to another country, sad but true. I HATE TAX BILLS - SOMEBODY SAY AMENNNNNNNNNNNNNNNNN!!!! !